Bride & Groom presents Love and Light Wedding Festival. Date: 10am – 4pm Sunday April 14, 2019 at the McIntosh Centre Shepparton. Wedding planning can be complicated stuff – finding the perfect venue and suppliers doesn’t have to be! 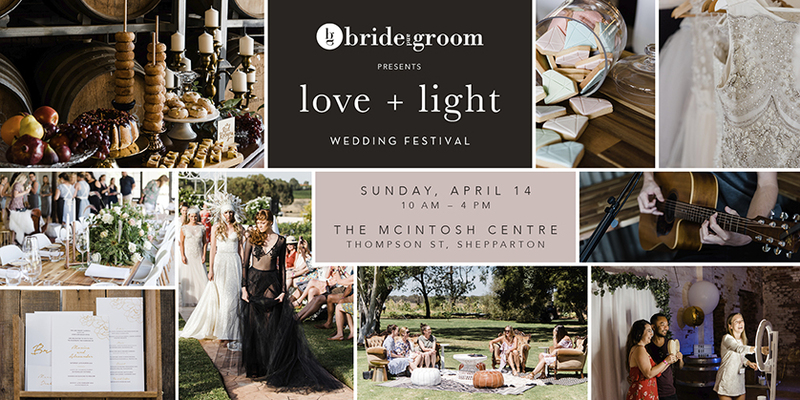 Fresh and contemporary, Love + Light Wedding Festival showcases the region’s best venues and most creative wedding suppliers, making finding your dream team easy! Gather your tribe for a day of wedding planning, adventure and fun featuring a spectacular runway event and interactive wedding festival. Buy individual tickets for $20 per person. Children Under 15 Free.